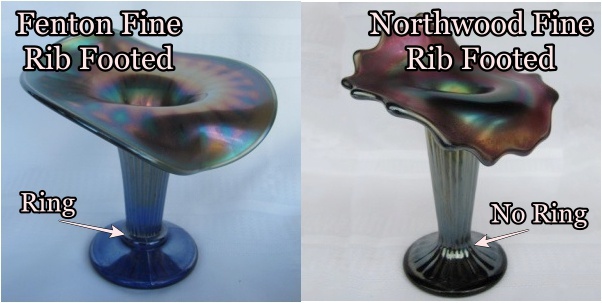 Fine Rib Footed vases – Fenton or Northwood? Fine Rib Footed only comes in a vase. At one time this vase was called Jack in the Pulpit (JIP) because that was the only shape that it was found in, but as time went on more and more of these vases were found ruffled. So the name no longer fit. As more research was done it was found that there are two different molds and that both Fenton and Northwood manufactured this vase. Although they are similar, there are some very obvious differences to help you identify the manufacturer.